There’s a reason why a lot of folks think scotch drinkers are snobs – it’s a (relatively) pricey dram. But so is anything that’s been stored in a warehouse for 12+ years and then exported over the Atlantic ocean. 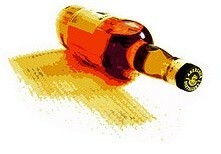 The reality is that scotch whisky is expensive because it’s often aged for a very long time and in another country. If we were to shorten the aging period and do it domestically, it’d be cheaper. But wait! We do – it’s called bourbon. By Scottish law (Scotch Whisky Regulations 2009), scotch whisky must be produced in Scotland from water and malted barley. It must also be matured in an excise warehouse in Scotland (aged for at least 3 years). So until it goes into a bottle, it has to remain on Scottish soil. There are, of course, other rules and regs but these are the ones that matter for the comparison between Scotch and Bourbon. For a bourbon to be labeled as such in the United States (The Federal Standards of Identity for Distilled Spirits), it must be produced in the United States from a grain mixture of at least 51% corn and aged in new, charred-oak barrels. Straight bourbon must be aged at least two years (if less than 4, the age must be listed on the bottle) but there is no minimum required aging period for other labels. I know some of you will say that bourbon is different because it uses 51% corn with rye and barley instead of just barley. And you’re right, it is different. But is the difference that much greater than an Islay and a Speyside? Comparable. I’d had a few bourbons before, Four Roses sent me some of their fine spirits in the past, but I really didn’t get a full appreciation of it until my friend Dave brought over a bottle of Basil Hayden Bourbon. We poured a few glasses of it neat and thoroughly enjoyed it. The price, around $40-45 per 750ml, puts it on par with some of my favorite scotches (Balvenie DoubleWood comes to mind). Of the 23 Double Gold bourbons from the most recent SF Spirits Competition, ten could be had for $35 or less. In my research about affordable bourbons, I discovered this fantastic post by one of the judges of the SF Spirits Competition in bourbon, Fred Minnick. The next time I visit the local store I’m going to try to find a few of these gems, especially the $20 1835 Texas Bourbon (a search online showed it wasn’t going to be there :(). Do you enjoy bourbon? Do you have a favorite I should try? One of the great pleasures of writing about Scotch all the time is that it gives you a good basis by which to “compare” other spirits. 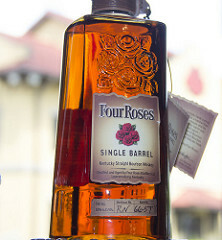 Recently, I had the opportunity to sample a few different expressions from Four Roses Bourbon. Bourbon is a type of American whiskey made in Bourbon County, Kentucky. Bourbon, like Scotch, is a distilled spirit that is aged in barrels but the primary component is corn (Scotch whisky relies on barley malt, rather than corn). Like Scotch, there are a series of rules that are required of spirits carrying the bourbon name. For example, the grain malt has to be at least 51% corn and must be bottled at 80 proof or higher. One big difference between scotch and bourbon, besides the malt used, is that bourbon is aged in new, charred oak barrels and is usually aged briefly (two years minimum and usually less than four years). The end result is a spirit that has a different character than scotch. It’s a lot like what you’d expect out of a precocious United States versus an Old World Scotland. As you’d expect from a spirit aged longer, 12 year scotches are typically smoother than bourbons aged less than four years. Bourbons typically have less of the oak components you associate with red wines and scotch. They do, however, have their own delightful characteristics that add to the character of the spirit and makes it suitable for many occasions. Four Roses has a variety of expressions but the three I tried were the Single Barrel, Small Batch, and Yellow. I tried each neat, no ice or water.